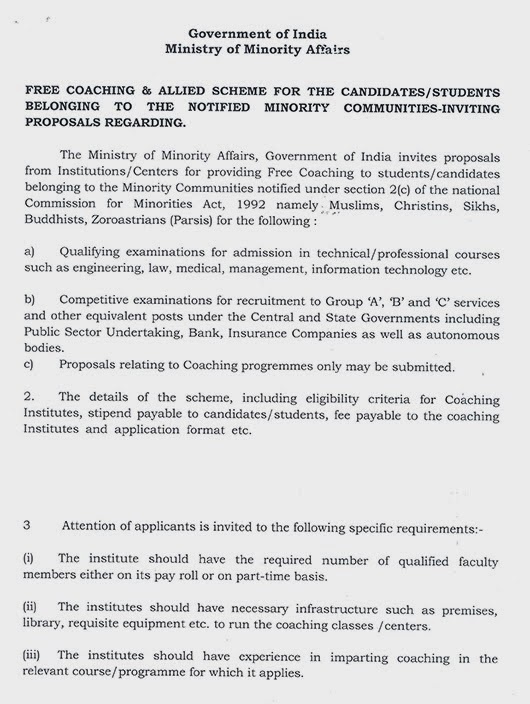 NON-FCRA PROJECT: FREE COACHING AND ALLIED SCHEME FOR MINORITY COMMUNITIES STUDENTS. The scheme aims to empower the students/candidates of notified minority communities, which are relatively disadvantaged section of our society vis-a-vis their skills and capabilities to make them employable in industries, services society, by assisting them as well as those institutions working for them, towards in-resilience to adapt itself to the market dynamics on a continuous basis so that the target groups are not deprived of the professional acumen demanded by the enhancing and business sectors in addition to the government sector. It has the built changing/ emerging market needs and opportunities for employment at domestic as well as international levels.